Delaney and Luke competed in the inaugural Houston Kids Triathlon at the University of Houston last weekend. It was the largest kids triathlon in Houston history. Delaney finished second, adding another medal and trophy to her immense hardware collection. Luke finished 13th, in only his second triathlon. It’s really cool watching a thousand kids swimming, biking and running early in the morning. Big fun. Posted on April 16, 2012 by KentPosted in LifeTagged sports, triathlon. 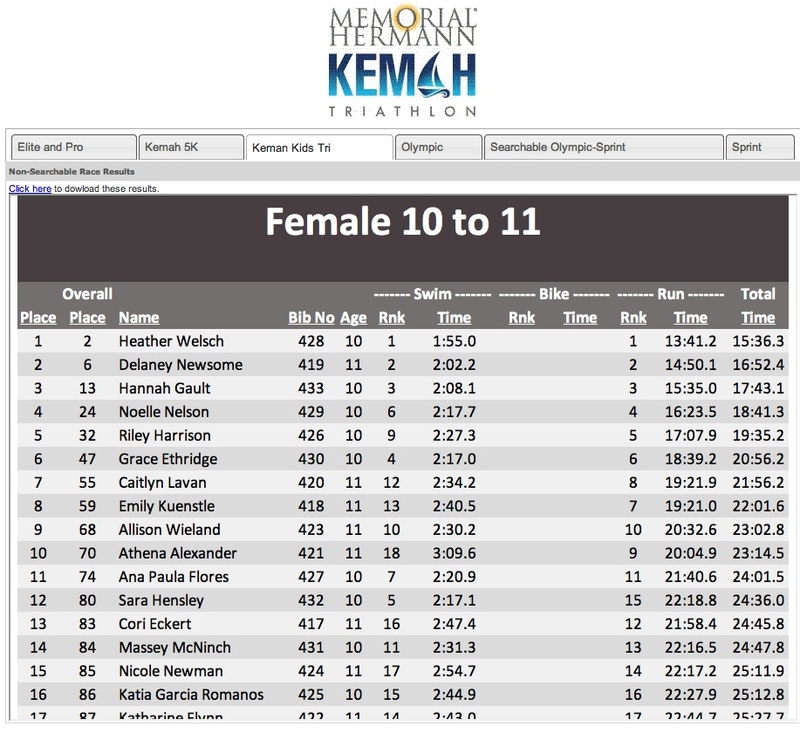 On Saturday, Delaney won the 2011 Sugar Tri Kids triathlon in Sugar Land, Texas. Sugar Kidz is the third biggest kids triathlon in the United States. Her chip fell off during the swim, and she had a slow bike to run transition when she couldn’t find her spot. But her bike and run was excellent. She and her friends Rachel and Arabel swept the 10-year old division, finishing 1-2-3. The Sugar Kids Tri was Luke’s very first triathlon. He finished 4th in the 5-year old division. The Sugar Tri Kidz is a fun and very well run event. We had a good time. Delaney finished first in her triathlon this morning. She works hard, and I love to see her reap the benefits. Delaney competed in her second triathlon, in Clute, Texas, this weekend. She finished 2nd in her class. Delaney’s 2nd Triathlon from Kent Newsome on Vimeo. Music: I Go Hard, by Gangstagrass, from their excellent record Lightning on the Stings, Thunder on the Mic (purchase @ Amazon).